As we reported earlier, the coordinators of the campaign "For Fair Elections-2012" in Orsha registered a number of violations of the Electoral Code of the Republic of Belarus in electoral districts Nos. 26 and 27. 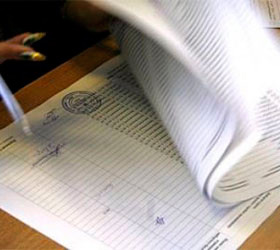 The violations were reported to Orsha Investigative Committee by sending a notice of infringement of Article 54 of the Electoral Code, dealing with voting at the voter’s residence. The statement said that at a number of polling stations there were instances when the lists of voters who choose to vote at home failed to match the figures announced upon the opening of ballot boxes. The Investigative Committee declined to consider the matter on the merits, and forwarded the appeal to Orsha town police department. A month has passed since then, but there is no response from the police as yet. In the opinion of the observers, Orsha police chiefs are apparently reluctant to investigate the facts of violations of electoral legislation and to give them a legal assessment.